November 2017 – The official website of author and storyteller David Neilsen! Can You Keep Up with Dr. Fell? Greetings and salutations one and all! 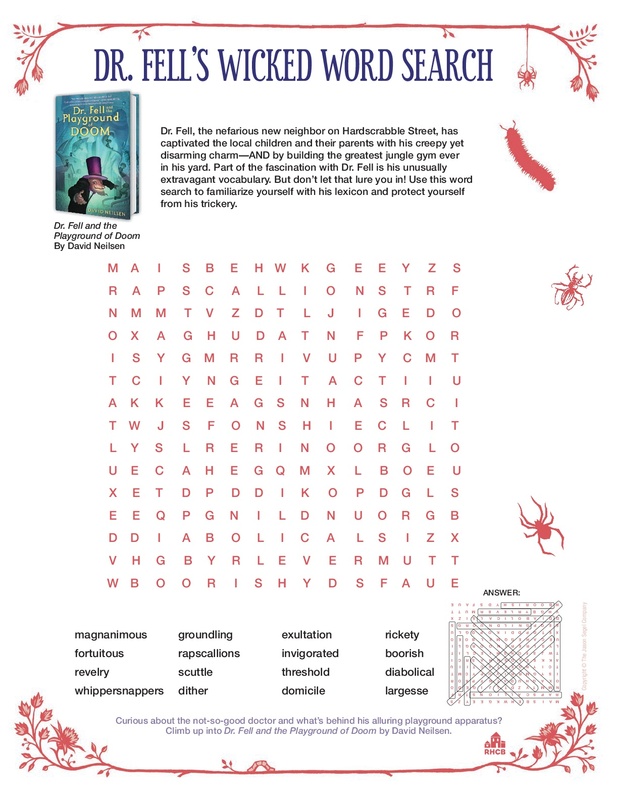 Dr. Fell’s Wicked Word Search is available as a free download as both a PDF and a JPG. It’s the perfect activity for those cold, snowy (or just really cold), Winter afternoons spent lazily in front of the fire. Dazzle your friends! Confound your enemies! Defeat Dr. Fell! Author neilsendavidPosted on November 20, 2017 November 20, 2017 Categories Books, General Mischief, UncategorizedTags activity, dr. fell, word searchLeave a comment on Can You Keep Up with Dr. Fell? Endings are hard to write. It wasn’t. She changed her mind. Writers do that. I have leaped with great gusto into writing a new book. It has been some time since a story grabbed me and shook me into submission like this one, and I’m loving it. The start was easy. I raced through about 8 or 9 chapters lickedy-split. I’ve also gone to the trouble of mapping out the entire book. I know what’s going to happen, how it ends, everything. Don’t have the final word nailed down, but I’ll figure it out when I get to it. So far, everything is awesome. Somewhere around chapter 10, I ran into a problem. Looking at my notes, there is a very specific “X happens now” note, which is great, but it’s more of a guideline. The note’s actually closer to “X shows up here.” So cool, X shows up. But I didn’t actually say what X is supposed to do or how anyone is supposed to react to finding X standing in the middle of the puddling (Oops! Did I give too much away?). Looking further on my outline, the next event is “Y shows up.” Again, not that helpful. Beyond that, I get some very specific instructions on plot point Z and the story rapidly unfolds beat by beat to the end. So if I can just get past this obnoxious middle, I’m set. But I’m stumped. I know that I need X and Y to arrive before we get to exciting plot point Z. But X and Y can’t just show up and then everyone sits around for a bit until it’s time for Plot Point Z. Things need to happen. I’m just not sure what. I’m stuck in the mushy middle. It’s not that X and Y are empty characters. I have lots of very detailed things that X and Y will do as we get further into the book. I just didn’t think to have them do much more than plop their fictional fannies on a bar stool and twiddle their thumbs upon arrival. I’ve gone back to the beginning and edited and thinned and altered and tightened and made it even better and even more exciting and funny and cool. But then I get to “X shows up” and the writing process screeches to a halt. Making things harder is the fact that, due to the rules of the world I’ve created, there needs to be a period of time between the arrivals of X and Y and then more time must pass until Plot Point Z. I can’t just cram all three beats into one scene and be done with it. That would break the universe I’ve created. Because usually it’s the end that stabs you in the back, severing your spinal cord and making you flop to the ground like wet linguine. This past weekend I attended Kidlitcon, a middle grade book bloggers conference in Hershey, PA. Everyone was pretty pumped to be there, and the panels were a lot of fun. I was on a panel on the second day regarding Middle Grade Villains. There were five of us, and we took turns explaining why today’s villains are so much better than the cardboard cutouts of our own youth. It’s always great to meet other authors and hear their stories. Some of them are success stories, some are stories of perseverance. All of them are stories of writers. It’s always good to hear other people going through a lot of the same things that I’m going through. Makes me feel less alone. Misery loves company. The conference was held in The Hershey Lodge. As in Hershey chocolate. As in the entire town of Hershey is basically a huge company town. Of chocolate. The Hershey Lodge had little bowls of Hershey’s Kisses on every table, in every room. You couldn’t turn around without knocking a mass of Kisses onto the floor. I didn’t stay in the Lodge, but those that did told me that they found Hershey Chocolate Bars on their pillows, as well as chocolate soap in the bathroom. I imagine true chocoholics walk into this place and never return. They just consume so much chocolate that they become a permanent addition to the lodge. But I didn’t stay there. I stayed at The Comfort Inn down the road. There was no chocolate bar on my pillow. Well that raised a red flag. Yes, my hotel was filled to bursting with high school runners. These runners seemed to be very dedicated to their craft, as they were practicing running up and down the hall right outside my room until just past midnight. My room which was DIRECTLY across from the elevators. Like three feet away. So that any time anyone did something silly like arrive on the floor, I knew. Oh yes, I knew. All in all, it was a good weekend. I even got some writing done. At a writing conference. Well, OK, a book blogger’s conference. But bloggers write. And they blog about writing, so it counts, right?